Serving as a trusted business adviser and advocate, Miller Starr Regalia’s responsive legal counsel helps clients to confidently navigate California’s complex real estate laws with a high level of accessibility and personal attention. We have almost fifty attorneys in our Walnut Creek, San Francisco, and Newport Beach offices, all of whom concentrate on real property matters which makes us one of the largest real estate law practices in California. Our firm has experience in all real property related legal matters including transactions, acquisitions, dispositions, leasing, common interest development, construction, management, title, environmental, and land use, in addition to full-service litigation and dispute resolution services. Since our inception, we have approached real estate law differently than most firms. For us, it is more than a specialty; it is our focus. That is why we have dedicated our efforts to California businesses and property owners, with sound advice and solutions for all facets of their real estate legal needs. Miller Starr Regalia has had a well-established reputation as a leading real estate law firm for more than fifty years. 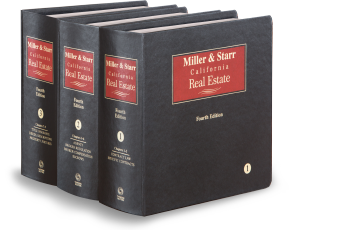 For nearly all that time, the firm also has written Miller & Starr, California Real Estate 4th, a twelve-volume treatise on California real estate law. THE BOOK is the most widely used and judicially recognized real estate treatise in California and is cited by practicing attorneys and courts throughout the state. We are committed to supporting the communities in which we work. Miller Starr Regalia’s rich philanthropic history demonstrates our commitment to making an impact in the community. As California’s preeminent real estate law firm, we are in a unique position to make a difference by providing pro bono legal representation to individuals and nonprofit organizations in our community in various real property matters. We also give back by providing personnel and funding to several nonprofit organizations and our attorneys and staff maintain leadership roles in numerous community and professional organizations. Our attorneys frequently team with Bay Area Legal Aid to provide skilled representation to low-income families, the elderly, veterans, people with disabilities, and single mothers. We provide pro bono services through local bar associations, low-income housing providers (such as the Alameda Development Corporation), and Habitat for Humanity. In addition to helping Habitat for Humanity pursue new projects from a legal perspective, Miller Starr Regalia attorneys and staff also contribute sweat equity by participating in the construction of Habitat for Humanity projects. Our firm actively collects food and raises money for the Food Bank of Contra Costa and Solano’s Food from the Bar program. We also endow the Ed & Gwen Regalia Endowment of the Kennedy-King Memorial College Scholarship Fund. The fund was co-founded by Ed Regalia in 1968 to provide college scholarships to minority students with financial needs who have excelled in Contra Costa County community colleges in order to assist them in pursuing a four-year degree. Our attorneys further extend their commitment to the community by taking leadership roles in numerous community and professional organizations. A diverse workforce creates a better work environment, makes us better lawyers, and enables us to better serve our clients’ needs. Diversity was instilled by our founding shareholders as a core value of the firm since 1968 when Ed Regalia co-founded the Kennedy-King Memorial College Scholarship Fund, in memory of Martin Luther King, Jr. and Senator Robert F. Kennedy, to provide college scholarships to minority students from Contra Costa County. Miller Starr Regalia continues to uphold the ideals of our founders and considers diversity to include individuals of differing life experiences and backgrounds as well as protected characteristics such as gender, race, ethnicity, religion, sexual orientation, disability, and age. To successfully recruit, develop, and retain attorneys and staff of diverse backgrounds and characteristics. The firm’s Diversity Committee includes members of the firm’s Executive Committee, Hiring Committee, associates, and staff. The committee is tasked with taking specific planning and monitoring efforts to keep the firm continually focused on achieving its diversity goals.